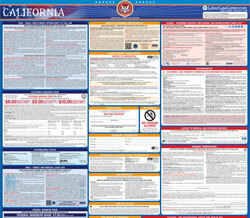 The Whistleblower Protections is a whistleblower law poster by the California Department Of Industrial Relations. This is a mandatory posting for all employers in California, and businesses who fail to comply may be subject to fines or sanctions. This poster must be posted in a conspicuous place where all employees will see it. This poster describes what a whistleblower is, how whistleblowers are protected and how to report improper acts of corporations and limited liability companies. It appears you don't have a PDF plugin for this browser. Please see the link below to download california-whistleblowersnotice.pdf. in order to conform t o the statutory requirement that the lettering be larger than size 14 point type. not complying with a local,  state or federal rule or regulation. Pursuant to California Labor Code Section 1102.5	, employees are the protected class of individuals. employee’s employment or place of employment. employee from being  a whistleblower. 2. An employer may not retaliate against an employee who is a whistleblower. state or federal rule or regulation. whistleblower in any former employment. and take other steps necessary to comply with the law. review and possible inv estigation.